When the First World War started, Stanley Spencer was 23 years old and had just graduated from the Slade School of Art in London. He volunteered in 1915 and became an orderly in the Royal Army Medical Corps. He worked at the BeaufortHospital in Bristol before he volunteered for the Salonika front, where he joined the 68th Field Ambulance unit and then transferred to an artillery regiment. He left Macedonia after the Armistice and finally came back to his native village, Cookham (Berkshire), in December 1918. He felt privileged to be alive, but also guilty. So many had died, not the least his brother Sydney, who had been killed on the western front in September, just before the end of the war. A few months before the Armistice, Stanley Spencer had received a letter from the British War Memorials Committee, asking whether he would like to create a painting for the planned Hall of Remembrance (which was never built). It was suggested that he paint a religious service held for troops at the front, but ultimately he was free to represent whatever he wanted. 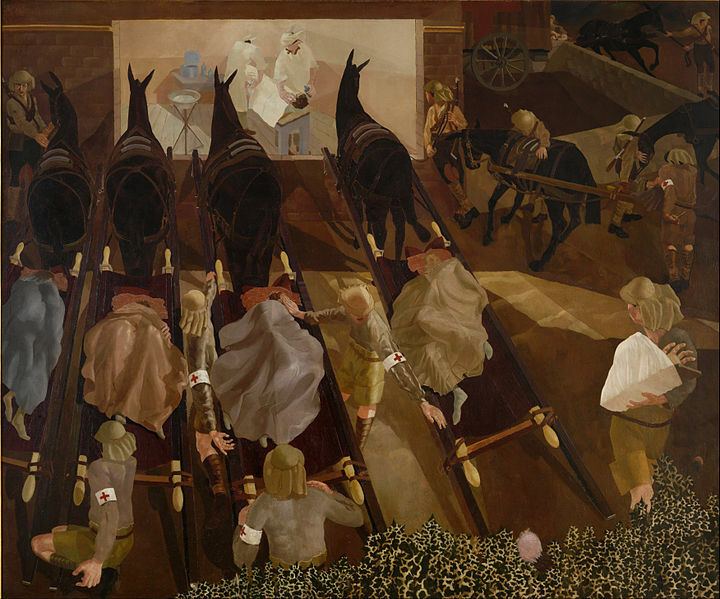 Spencer accepted and in 1919 delivered a painting entitled Travoys Arriving with Wounded at a Dressing-Station at Smol, Macedonia, September 1916. It did not represent a religious scene at such, but the painter did imbue an ordinary war scene with a spiritual aura. The scene is inspired by Spencer’s experience with the Field Ambulance unit in Macedonia. Many times he had to accompany these convoys of mule-drawn stretchers (“travois”) from a meeting point close to the front to the dressing-station. The painting shows the travois arriving at night. They have just emerged from the dark and converge towards the source of light: an opening in the building, through which we see the operating theatre with its medical staff performing a surgery. From this bright room, light is projected outside and the arriving soldiers find themselves gently bathed in it. As many have observed, the composition of this nocturnal scene – the mules arranged in a row, gazing at the operating theatre through the window – is reminiscent of a Nativity scene. This painting thus evokes a Biblical episode celebrating life. There is indeed a sense of peace in this painting. Spencer did not want to represent the atrocities of war, the devastation and pain it brought. The wounded soldiers are shown with restraint. They are covered with blankets so that we do not see their wounds. There is not a single drop of blood in this scene, not even in the operating theatre, which appears as a silent and serene place. About scenes with wounded men that he had witnessed, Spencer said that, to him, it was “not a scene of horror but a scene of redemption.” He also explained that his painting “is intended to convey a sense of peace in the middle of confusion. The figures on the stretchers have been treated with the same veneration and awe as so many crucified Jesus Christs and not as conveying suffering but as conveying a happy atmosphere of peace.” The artist compared the wounded soldiers to the dying Christ. Such analogy between Christ’s sacrifice for the redemption of humanity and the soldier’s sacrifice for a greater cause was not uncommon during and after World War I.
Spencer justified his intent by recalling how Christian believers look at the death of Christ: “I was right in making it a happy picture, as the early painters were right in making the Crucifixion a happy painting.” Here he must have been thinking about the depictions in which Jesus is crucified but appears peaceful and does not display any signs of suffering: he triumphs over death. The crucifixion is a happy picture because Christ’s ultimate sacrifice carries the promise of the resurrection. It is a symbol of hope. The wounded soldiers have made a sacrifice and are now arriving at a resting point, where the medical staff will help them, take care of them and one hopes save them. He could thus confer a sacred aura, a “spiritual ascendancy” to a trivial war scene. In Spencer’s painting, the ordinary opens up to let something heavenly shine through: the possibility of resting and the promise of peace after the war. For a moment, as they are stepping in the light cast on the dark by the operating theatre, the soldiers’ sufferings are transcended and peace and relief are experienced. Stanley Spencer (1891-1951) was an English artist who studied at the Slade School of Art (1908-1912). He is well-known, in particular, for his religious paintings which often represent Biblical scenes occurring in his native village of Cookham. Two of his most famous works are connected to wartime: the Sandham Memorial Chapel in Burghclere, which reflects on his experience of the First World War, and the cycles of paintings of shipyards at Port Glasgow, commissioned by the War Artists’ Advisory Committee during the Second World War. Caroline Levisse is an art historian currently based in London, where she teaches art history at the Workers’ Educational Association. In her doctoral dissertation she studied the different ways in which art and religion interact today in Scandinavia (“Art et religion en Scandinavie depuis 1990, Université Paris 8, 2013).